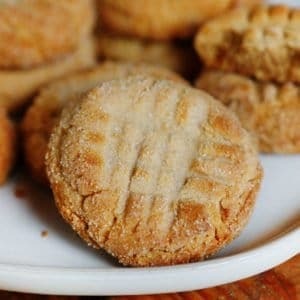 We have taken this classic cookie and added a bit of crunch to make it our new favorite way to make Peanut Butter Cookies! Preheat oven to 375°F (190 degrees C). In a large bowl, cream together the peanut butters, butter, granulated sugar, and brown sugar until well blended. Scoop dough into balls. (I used a 3-tablespoon scoop). Roll each dough ball in granulated sugar. Press each ball once with crisscrossing fork tines. Bake for 8 to 10 minutes in the preheated oven, or until edges are lightly browned. Do not overbake!